Felted Crochet Bag Pattern - Wow 'em! 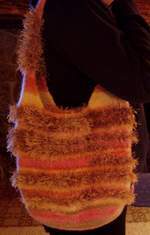 This great felted crochet bag pattern is so easy but looks morecomplex than it is. The random placement of the eyelash yarn gives this bag a fun and funky feel. It's great for every day and you don't have to use the eyelash if you don't want to. Just crochet away in the round & see what the stripes do. I just added a strand of eyelash whenever I came upon the same color in the wool yarn, then ended the eyelash when the gold merged into the next color. Doesn't it look effective though? Pretty hip and sassy felted crochet bag pattern, I'd say. So - I used Ocean Sunset Ombre 100% wool yarn, but you could try the Patons SWS as that also has the long space dyed look. As long as your gauge fits the one below, you'll need a total of 350g (525yds, 483m, 12.5oz) of the wool yarn and 150g (201yds, 186m, 5.4oz) of eyelash yarn (this amount may vary depending on the wool yarn you choose and the amount of the corresponding eyelash color it has in it), a size H/8 5mm hook, and a blunt end needle and scissors for finishing ends. Stitches you'll need are...chain, half double crochet, slip stitchand half double crochet 2 together (see below). [Yo, push hook in next st, yo, pull hook through] twice (5 loops on hook), yo, pull through all loops. Gauge - over hdc in wool only before felting - should be 13sts X 10 rows = 4 inches. Size before felting - Base - 12.75" X 5"
Strap - 27" long X 2.25"
Strap - 26.5" long X 1.5"
The reason this doesn't show as much shrinkage as a felted crochet bag pattern only made from wool, is the addition of the eyelash yarn which does not felt. If you choose not to use eyelash with your wool, your bag will shrink more. Throughout whole pattern turn after each row. Base - Ch41, hdc in 2nd ch from hook & ea ch to end (40sts), turn. Ch1, hdc in ea st to end. Rep row 2 for a total of 14 rows, turn. Main section - Ch1, hdc in each st across row, hdc in end of ea row (14sts) along short edge, hdc in ea foundation loop, hdc in end of ea row (14sts) along other short edge, join with sl st to starting ch (108sts). Ch1, hdc in each st around bag joining with sl st & turning after each row. Join in eyelash yarn where yarn changes to eyelash color. When color changes again, break off eyelash & continue in only wool until eyelash color begins again. Work over ends of eyelash to finish off as you go. Work a total of 32 rows, then DO NOT TURN, sl st across 10sts, turn, ch1, hdc34, turn. Ch1, hdc2tog, hdc in ea st to last 2sts, hdc2tog, turn. Dec 1 st at ea end next 12 rows of strap as per prev row to 8sts. Work straight on these 8sts for 36 rows. Inc 1 st (by working 2hdc into same st) at ea end every row to 34sts. Counting around top of bag from other end of strap, sk20sts, then join strap to next 34sts of bag by working sl st through both layers. Break yarn, finish off, weave in end. TA-DA! you've finished following your felted crochet bag pattern, well, except for the felting part. Make certain that your end is woven in. I say end, not ends, as you should have been working over the starting end and the ends of eyelash as you went along. This is fine for a felted bag, as the ends can not work loose once the finished bag is felted. Pop your finished bag into a mesh laundry bag, making sure it's fastened shut (if it's not properly fastened & you choose to put something else in the washer too, your bag may end up more "fuzzy" due to the added friction). then drop your project into the washing machine and let it do its magic. If you feel it hasn't felted properly, repeat the felting process without drying the bag first. When properly felted you shoudn't be able to distinguish individual stitches. To dry your bag, you can either toss it in the dryer on low, or if you prefer you can stuff it with paper or plastic bags to help it form a nice shape and allow it to air dry. Are you done? What do you think of this felted crochet bag pattern then? If you like it, let others know about it, so they too can have a cool, hip, funky bag to tote around. Fancy a ripple scarf too?